Simple parts make even the most advanced modern equipment possible, and shafts are one of those vital components. However, not all shafts are created equal and the quality of a shaft depends on the skill of the machinist and the manufacturing process of the part. 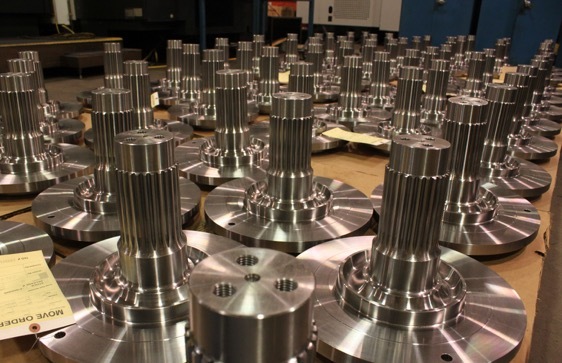 At Allis Roller, we specialize in complex machined parts, and producing shafts that hold up even under the highest levels of wear and tear comes with the territory. Allis Roller shafts are used in some of the toughest equipment in mining, agriculture, and manufacturing, meaning they have to hold under high-pressure, extreme temperatures, and significant wear. In agriculture, our shafts drive the rubber tracks on 4WD tractors, as well as the augers, chains, belts, and wheels in combines. Our shafts also power the drive trains in heavy duty mining trucks, while holding up against long term exposure to rock and debris. Industrial compressors also make use of Allis Roller shafts, which drive the gate rotors that create compressed air. These types of heavy equipment weather everything from dirt and concrete to inclement weather and manufacturing warehouse conditions, and our shafts have a reputation for helping to keep them running. So how do our shafts hold up under such harsh conditions? It’s all in the process. We start with high strength steel alloy that is heat treated for extra toughness, because inferior materials won’t hold up under the conditions our customer’s need them to. In order to ensure that the shafts fit properly into the machines that house them, they are then precision ground to perfection. Some shaft designs require splines, which Allis Roller hobbs and broaches in-house. The machines we use to manufacture our shafts are a Samsung CNC lathe with live tool, 24-inch chuck and 9.6” diameter steady rest, and a Fryer with dual 20” chucks, 30” diameter X 115” long shaft capability, and 12.2” diameter auto steady rest, but our overall offering of services goes far beyond what those machines can produce. Due to the reputation Allis Roller has built for creating ethical business relationships, we’re also able to rely on some of our neighboring manufacturers to offer additional shaft features at a low cost to our customer base. Just two blocks away from us, Hudapack allows us to heat treat our parts, while Precision Gears fabricates special splines. Custom Production Grinding allows us to access their specialty CNC grinding equipment, and Spinweld contracts with us for friction welding services. And for those final touches, Hydro-Platers and Industrial Finishing provide us with chrome plating and painting services, respectively. Fostering solid relationships with fellow local businesses allows us do more for our customers in a cost-effective way, and we’re proud to give those companies credit for their role in creating the high quality shafts and complex machined parts Allis Roller produces. Combined with our engineering skills, specialty processes, and precision equipment, leveraging those strategic relationships is part of what makes an Allis Roller shafts superior in durability and performance. For more information on Allis Roller shafts, our manufacturing processes, or the strategic partnerships we build with fellow manufacturers, connect with one of our complex parts experts via the Contact page.